Bellevue Incline looking down (south) at Elm and W. McMicken. 201-207 W. McMicken can be seen on the right side of the image. Courtesy of CincinnatiViews.net. 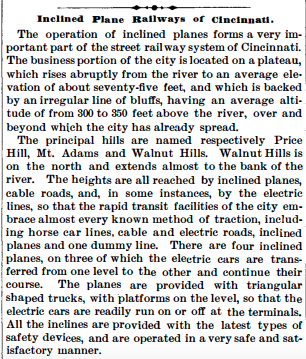 "Inclined Plane Railways of Cincinnati," Scientific American, August 11, 1894. Courtesy of JSTOR, University of Cincinnati Libraries. A rendering of the Bellevue Incline. Can you imagine living just opposite this? Courtesy of CIncinnatiVewis.net. The renovated depot, built in 1890. Courtesy of CincinnatiViews.net. All of the inclines except the Fairview one had hilltop entertainment: Highland House in Mt. Adams, the Bellevue House above 205 W. McMicken and the Price Hill House in Price Hill. The Bellevue House, party-central. Courtesy of CincinnatiViews.net. Bellevue House in the winter. Courtesy of CincinnatiViews.net. Sadly, Blue Laws (no alcohol/sales on Sundays) enforced during the Progressive Era (turn of the 20th century) badly hurt business at the Bellevue House—to the point that it became under- and then unused by the early 1900s. Fortunately for CSR, CIP's Mt. Auburn incline had earned a reputation for unimpressive frugality compared to all other inclines. Passengers commented that the ride was expensive but unpleasant. The operators were young—notably rude—boys hired to save costs. In fact, after a competing Mt. Auburn cable railway was installed in the late 1880s, CIP feared its end. Some thought the Kilgour brothers would buy it—and it seems they intended to—but instead a syndicate company from Louisville, headed by Hardin H. Littell and backed by Fidelity Trust Company of Louisville, purchased a controlling interest in 1888. Modernization of the old horsecar line soon followed: it was equipped with electric cars that carried people from downtown to the zoo by early summer of 1889. It was Cincinnati's first large-scale electric trolley operation. The Kilgour brothers were less than pleased. In 1873, Charles had formed the City and Suburban Telegraph Association and by 1877 he added telephone operations to this telegraph company. When his company began to receive complaints about telephone interference (a strange buzzing noise), the Kilgours blamed CIP's new electric lines. The legal battle wound up in Cincinnati's Supreme Court. Presiding judge William Howard Taft (later our president)—who admitted he did not know too much about this issue—ordered the CIP to stop using its single-wire system within six months and replace it with a double-wire one. People balked. Trollies across the U.S. were almost all using a single-overheard-wire system. Adding a second overhead wire would have bankrupted CIP. Its attorney appealed and eventually Taft's decision was overturned. An almost accident at the Bellevue Incline. "Plunged: Through the Heavy Iron Gates And Hung on the Edge of the Huge Track,” Cincinnati Enquirer, August 1, 1892. Courtesy of the Public Library of Cincinnati and Hamilton County. For sure, these accidents did not help the longevity of the inclines. But the occasional crash or mishap was not the sole reason for their demise. The inclines brought people up to the earliest suburbs and in doing so hastened Cincinnatians’ desire to travel further out from the city. But as transportation routes grew and as streetcars, buses and then automobiles began to proliferate into the early 20th century, incline passengers complained of multiple ailments: of the inconvenience of having to transfer lines, the comparative slowness of the inclines and the expense of riding them. Other transit means were just easier. In Price Hill, for example, when the 8th Street viaduct was constructed, traffic could easily pass over the Mill Creek Bottoms. The 8th Street line of the Cincinnati Street Railway Company began to run up Warsaw Avenue, making the incline obsolete. 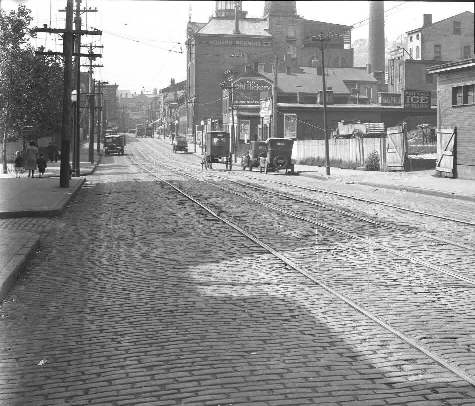 McMicken Ave. streetcar tracks in 1927, right in front of 205-07 W. McMicken. Courtesy of University of Cincinnati Libraries, Digitial Resource Commons. [i] "Bellevue Park," Cincinnati Parks, accessed January 8, 2018, http://www.cincinnatiparks.com/central/bellevue-park/. 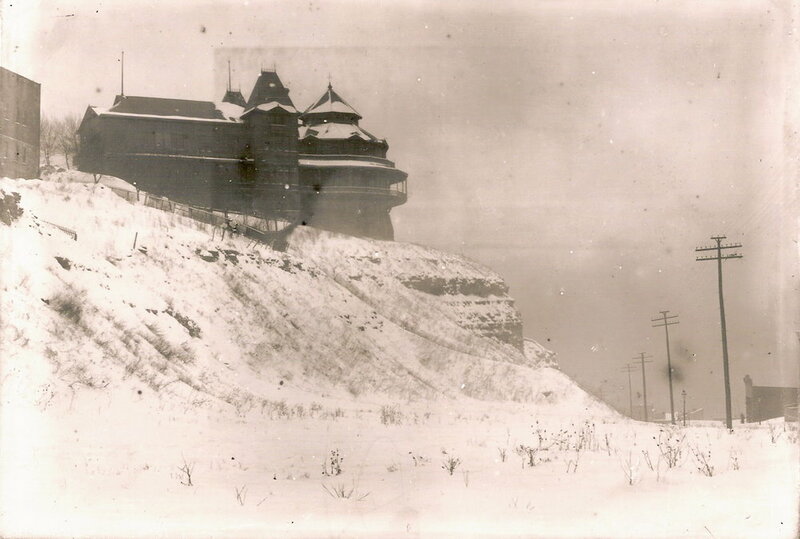 [ii] Jeff Suess, Lost Cincinnati (Charleston: The History Press, 2015), 41; John H. White, Jr., “The Cincinnati Inclined Plane Railway Company: The Mount Auburn Incline and the Lookout House,” 7, accessed December 21, 2017, http://library.cincymuseum.org/topics/i/files/inclines/chsbull-v27-n1-cin-007.pdf. [iii] White, Jr., “The Cincinnati Inclined Plane Railway Company,” 7-8. [iv] Suess, Lost Cincinnati, 42; White, Jr., “The Cincinnati Inclined Plane Railway Company,” 8-12. [vi] Suess, Lost Cincinnati, 44-45. [vii] Kramer, The Inclines of Cincinnati, 57-61. [viii] Kramer, The Inclines of Cincinnati, 17, 23. [ix] Kramer, The Inclines of Cincinnati, 42, 44. [x] Kramer, The Inclines of Cincinnati, 51, 53. [xi] Kramer, The Inclines of Cincinnati, 80-81. [xii] Kramer, The Inclines of Cincinnati, 18. [xiii] White, Jr., “The Cincinnati Inclined Plane Railway Company,” 14-15; John H. White, "War of the Wires: A Curious Chapter in Street Railway History," Technology and Culture Vol. 46, No. 2 (Apr., 2005), 377-383. [xiv] Ibid; Steven J. Rolfes, Cincinnati Landmarks (Charleston: Arcadia Publishing, 2012), 56. [xv] “Plunged: Through the Heavy Iron Gates And Hung on the Edge of the Huge Track,” Cincinnati Enquirer, August 1, 1892, Public Library of Cincinnati and Hamilton County. [xvi] White, Jr., “The Cincinnati Inclined Plane Railway Company,” 18-22; White, "War of the Wires," 383-384. [xvii] Kramer, The Inclines of Cincinnati, 63; White, "War of the Wires," 377. [xviii] Kramer, The Inclines of Cincinnati, 64, 66, 50, 56. [xix] Suess, Lost Cincinnati, 45-46; Kramer, The Inclines of Cincinnati, 8.